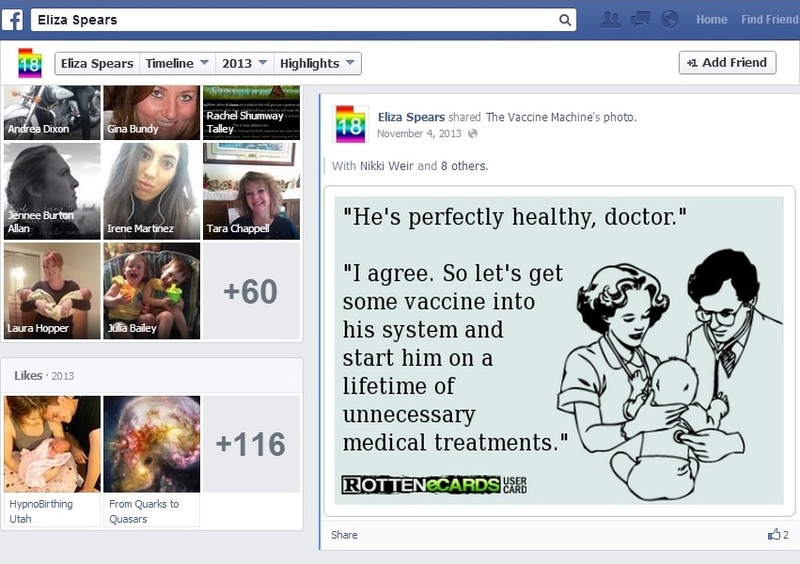 There is a curious overlap between anti-vaccination activists and midwives. It seems that it is hard to find a pro-vaccination midwife, despite the overwhelming scientific consensus that vaccines are a fantastic way to prevent illness. 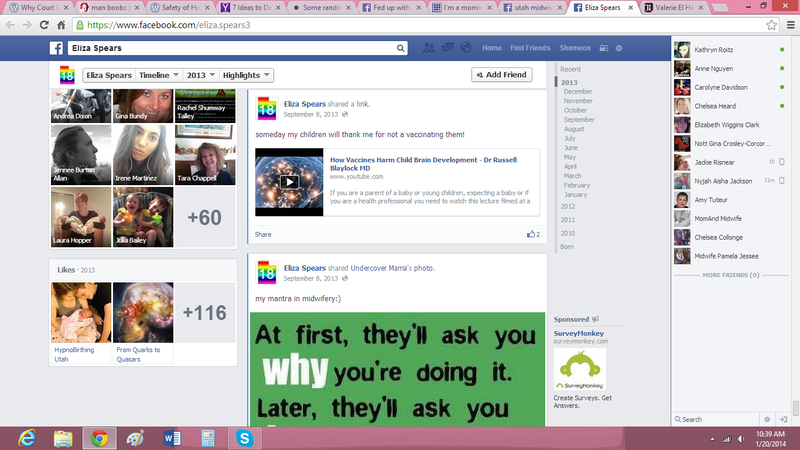 Midwives will outright tell patients anti-vax propaganda during their pregnancy- I should know, it happened to me. The midwife telling me reasons not to get a flu shot did not know that the flu is a virus instead of a bacteria, and she also believed that getting the flu shot causes the flu. I looked into the Midwives College of Utah and The Community School of Midwifery to see if midwives are actually being trained to reject vaccines or not. 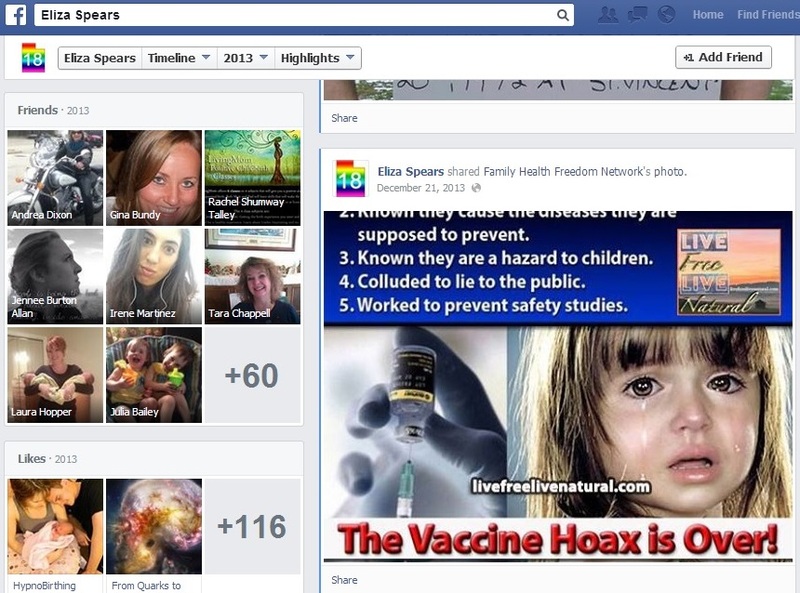 I could not find any vaccine specific information. But did I find an inadequate level of training for them to make any recommendations about vaccinations. The health courses that midwives take are very basic, and almost all related to birth, well woman visits, and newborns. Again, it is worth noting that when legislators ask midwives if they are practicing medicine, they vehemently claim that they are not in the business of practicing medicine. When their clients ask them questions that should be answered by a doctor, direct entry midwives claim to know what they are talking about and readily accept money for answering their questions. Luckily I was informed enough to know that the flu shot is a good idea for a pregnant woman. What is more troubling to me is the fact that there is not any requirement for midwives, who work with a vulnerable population (newborns and pregnant women), are not required to be vaccinated against possibly fatal diseases. This is yet another gap in the Direct Entry Midwifery Act that should be bridged by new legislation. Anti-vaccination midwives are totally at odds with the Utah Health Department’s vaccination initiative. Rates of vaccination are low in some parts of utah, and outbreaks of disease like measles and pertussis are increasing. This initiative is important and will save lives, but Utah midwives are purposely undermining this cause because of their own mistaken beliefs about vaccines. I do not think most parents who hire midwives know that they are not qualified to make a judgment for or against vaccination when they consult them. I certainly didn’t! I would not have asked if I did not think my midwife was knowledgeable about the process. This mom almost didn’t vaccinate because of the word of her midwife, so I was not the first or last person to make the mistake of asking the midwife about vaccines. “Ughhhh! 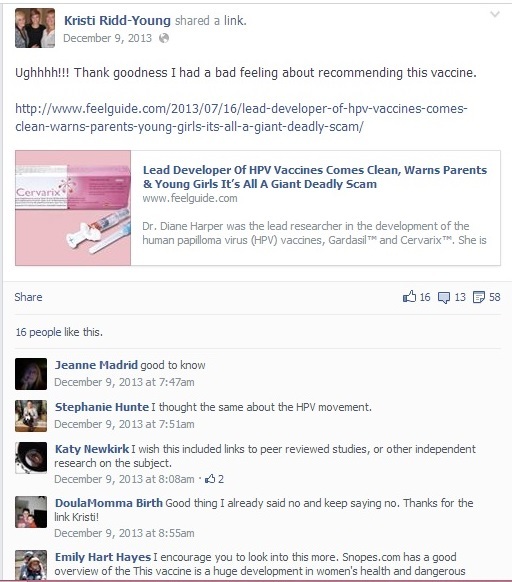 ank goodness I had a bad feeling about recommending this vaccine.” Someone (correctly) points out how there is a lot of information online about how the information Kristi linked to is not correct. Her response? 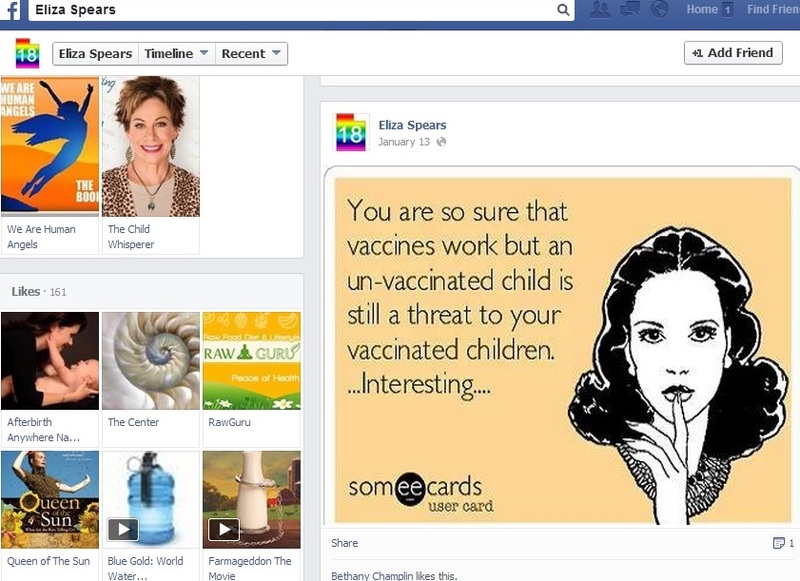 So her knowing some people with problems that she believes are caused by vaccines is enough reason for her to feel uncomfortable recommending it to people. That type of thinking privileges anecdotes over data, an obvious mistake when discussing matters of public health. Also, the nonsense about ‘no information that such a thing were possible” could be false as well. I have gotten vaccinated more than most people- I had my childhood vaccines twice because I could not obtain records and needed them to work in the medical field. The shot was cheaper than a blood test so I got everything again. I get a flu shot every year. When swine flu vaccine became available, I was the first one in line at the health department to get vaccinated. I have had gardisil and hepatitis b vaccines (three shots each). Every time I was either automatically given the CDC information sheet on vaccines or I was offered it. It is a requirement for informed consent. I am not saying that people behave perfectly or that the sheet is never forgotten, but it just seems much more likely to me that regular people likely skip reading detailed information about vaccines when they could be doing something else. It isn’t interesting to most people, and that is fine. This is also a story that cannot be verified because none of us have access to either of these people, the details can never be known. This is also a bit of nonsense that has been thoroughly debunked. 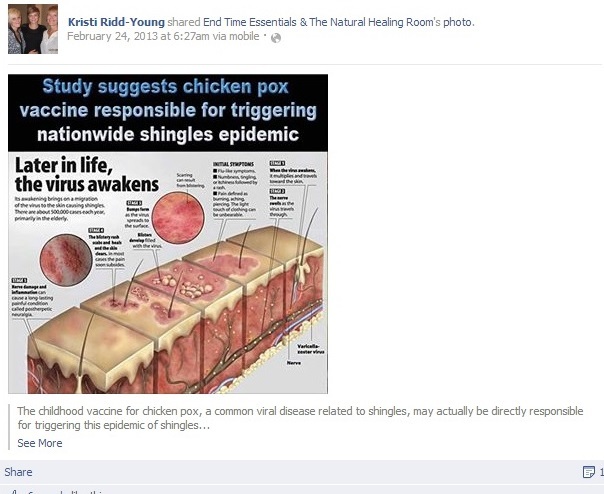 There has not been a meaningful connection made between vaccination for chicken pox and shingles. There seems to be some other factor causing an increase in shingles infections that has not yet been identified. If the president of the midwives college doesn’t know this, how can Utahans reasonably expect students to know? I would imagine that someone willing to publicly discourage vaccination would likely pass this message on to students, who in turn pass it on to their patients. The ripple effect of these damaging beliefs should not be underestimated. People can believe whatever crazy thing they want to- I don’t take issue with that. What I do take issue with is midwives acting outside their expertise and scope of practice in order to spread beliefs. They have a position of authority over the clients that they serve (even if every effort is made to negate that authority, it still exists). People trust midwives to tell them reliable information about their health, and instead they are told rumors and falsehoods. Midwives are unlikely to regulate themselves, so I believe that the Utah senate should step in and do something. I will have a new page up soon about how to contact your representatives and possibly a form letter for concerned citizens. UMO is a private group now! I guess they don’t want you to know what they are up to! That should be deeply concerning to anyone who votes in Utah! I was with a mother when she lost her baby at a home birth. I was acting as a doula, not a midwife. I might stop being a midwife someday, but I will never stop being a doula. It is too important to mothers. The mother was a nurse at a labor and delivery floor at a hospital. Her husband was a big, stoic, navajo man. I was helping her through contractions and she decided to get into the tub. Everything was fine, until the next time the midwife checked the baby’s heart rate. She couldn’t find a heart beat. We all, very calmly, drove to the hospital to confirm what had happened. The doctors gave her the bad news that there was no chance of a live birth at this point. I remember her husband standing in the corner, expressionless, but tears were coming from his eyes. I hugged him, and then held the mother while she cried, too. There was nothing to say. It is important not to try to fix what happened. I remember us all admiring the baby after the birth and the way the nurses dressed her. Just because the baby died didn’t mean it wasn’t still their baby, it is important to always treat them with the care you would give a live infant. They never tried to have another baby. But the mother losing her baby at home made problems for her at work. 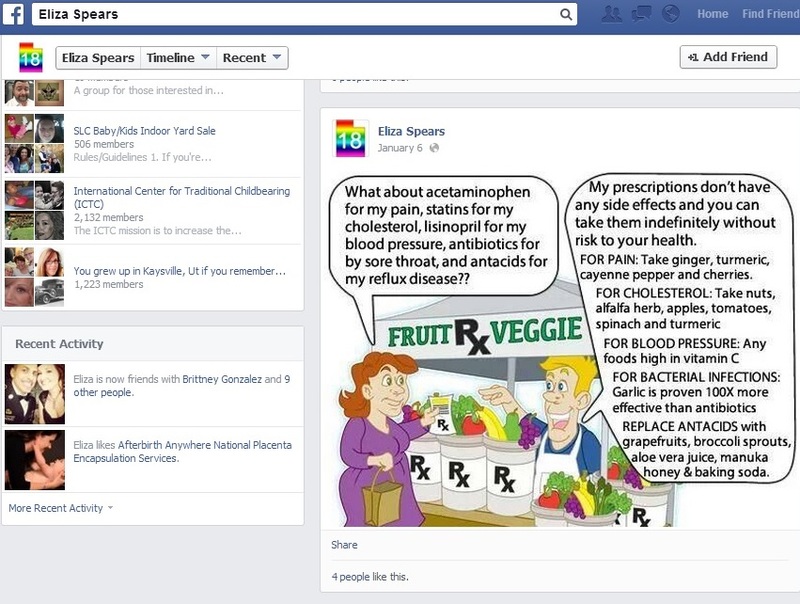 The other nurses blamed her for the death because she tried to birth naturally at home. They went as far as having a meeting with a pathologist to tell the other nurses that these kinds of deaths can’t be prevented, they can’t even pin down the cause a lot of the time, and that it most likely would have happened if she birthed in the hospital. I remember a red-headed woman leaving because she was way too upset to hear the entire story. I remember everyone buying this story, and I did too. It was my worst fear about natural birth- a sudden loss of heart beat. My heart ached for women who went through this, and I read more than one story about it. Every midwife made it seem like a sudden, unforeseen tragedy. Now I know that there is ample warning for fetal heart problems during labor, and that it probably could have been spotted if midwives were actually trained in recognizing trouble. If there really was an abnormal sudden drop, the baby could have been born quickly, via c-section (and possibly revived) in a hospital setting. I am doubtful that the meeting with a pathologist took place at all in light of this fact- how could L&D nurses be unaware of these facts? Midwives only seem to be able to spot trouble if the heart rate has dipped lower than is normal, but cannot discern other information that could save lives via electronic fetal monitoring. They can never know how many minutes it has been since the drop unless they just happen to be listening when the problem starts. If the president of the midwives college, a midwife who has decades of experience, does not know this, how can patients be expected to see through the lies? How many women have gone through losing their baby only to believe their midwife, support her, thank her for doing a good job? We can never really know. The ‘it was an unavoidable tragedy’ line is very important for midwives to learn, so that when babies die they can avoid being accountable to the mother or the community (and keep her fee of course). The fact that a woman who is the most powerful person in Utah midwifery believes this nonsense should be cause for grave concern for citizens and legislators- what other harmful myths does she teach midwives? How many lives will be lost as a result? 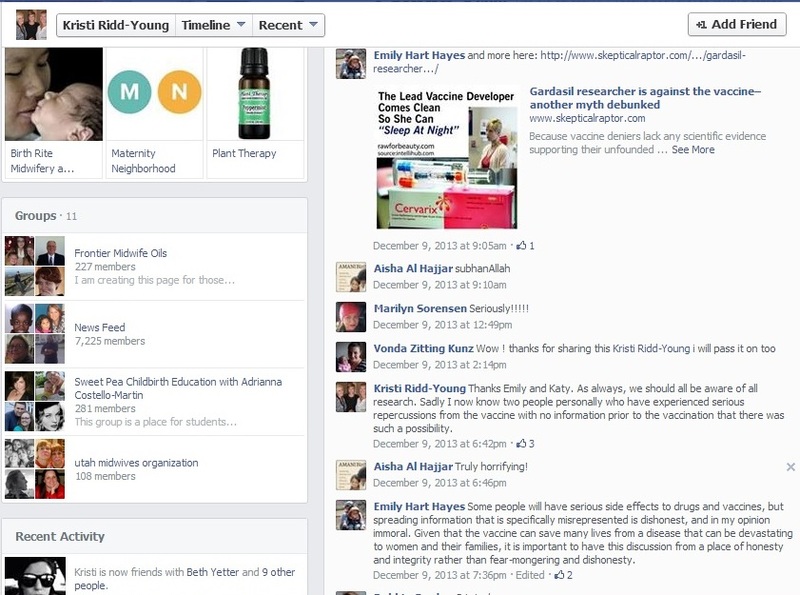 I should have seen the red flags in my doula training- like when I noticed that Kristi Ridd-Young being more concerned about pimping her supplements and essential oils than reviewing HIV transmission prevention for doulas. There were a few pages on it in our binders, but it was never brought up during class.